Unatelet, Judith, alias Pigou, of Amiens, bequest by, 580.
sons and executors of. See Pigou, J.
Underwood, John, tidesman, Lyme Regis, 596. Upton, Cath[erine], reversionary annuity, 719. -, -, reversionary annuity, 719. 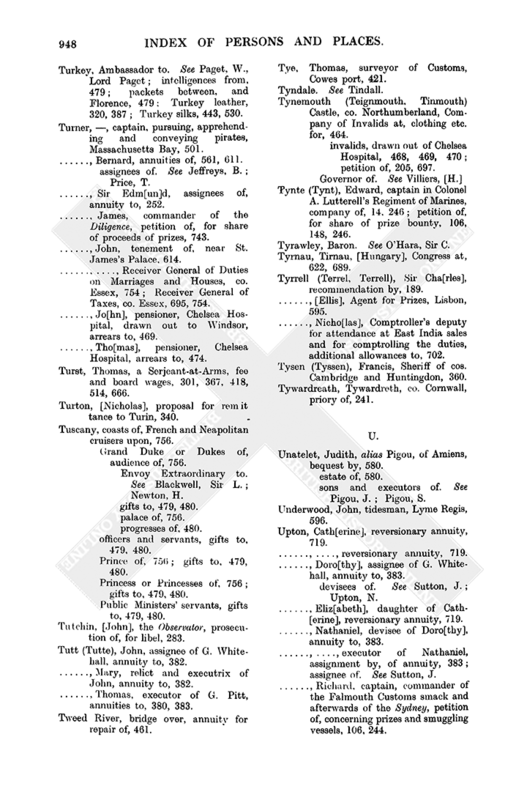 -, Doro[thy], assignee of G. Whitehall, annuity to, 383.
devisees of. See Sutton, J. -, Eliz[abeth], daughter of Cath[erine], reversionary annuity, 719. -, Nathaniel, devisee of Doro[thy], annuity to, 383. -, assignee of. See Sutton, J. -, Richard, captain, commander of the Falmouth Customs smack and afterwards of the Sydney, petition of, concerning prizes and smuggling vessels, 106, 244. Upwell, co. Norfolk, Moor Hall in. See Moor Hall. 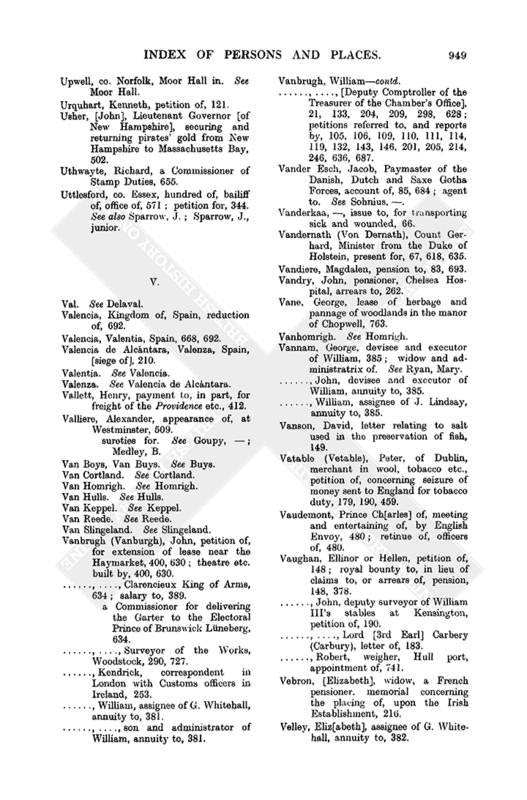 Urquhart, Kenneth, petition of, 121. Usher, [John], Lieutenant Governor [of New Hampshire], securing and returning pirates' gold from New Hampshire to Massachusetts Bay, 502. Uthwayte, Richard, a Commissioner of Stamp Duties, 655. -, petition for, 344. See also Sparrow, J.